For several years, J.K. Rowling’s Harry Potter series topped the American Library Association’s lists of the most-challenged books (reasons cited in 2001: “anti-family, occult/Satanism, religious viewpoint, and violence”). 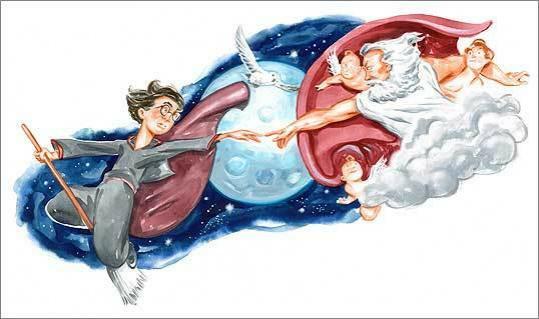 Evangelical Protestants were skeptical: would the positive depiction of wizardry mislead children? And some Catholics were worried too, ranging from Cardinal Joseph Ratzinger (now Pope Benedict XVI), who warned that “subtle seductions” in the text could “corrupt the Christian faith,” to the Rev. Ronald A. Barker, a Wakefield priest who yanked the books from his parish school library. At the same time, scholars of religion have begun developing a more nuanced take on the Potter phenomenon, with some arguing that the wildly popular series of books and films contains positive ethical messages and a narrative arc that is worthy of serious scholarly examination and even theological reflection. The scholars are primarily interested in what the books have to say about the two big issues that always preoccupy people of faith - morality and mortality - but some are also interested in what the series has to say about tolerance (Harry and friends are notably open to people and creatures who differ from them) and bullying, the nature and presence of evil in society, and the existence of the supernatural. Well, thank heavens is all I can say. As a big fan of the books and the movies (though the last movie was looooong and daaaark) I could never fathom how otherwise intelligent Christians could miss that the stories are about, um, good and evil. To use some Ignatian language, it is the perfect fictional representation (or at least as good as you can get outside "The Lord of the Rings") of the "Two Standards," meditation from the Spiritual Exercises of St. Ignatius--with Harry and his loyal pals on one side and Voldemort and all his pomps on the other. In the Exercises, St. Ignatius invites the retreatant to consider "how Christ calls and wants all under His standard; and Lucifer, on the contrary, under his." The Two Standards is primarily a meditation on how those two "sides" work in our lives. The "Harry Potter" series enables us to contemplate the same, using the now-familiar characters of Harry, Ron, Hermione, Dumbledore and Hagrid; not to mention Voldemort, Malfoy and Snape: how evil and good work, how they look, how they seem, how they feel, how to recognize them. (Just look at that last grouping of names, for Pete's sakes, if you have any doubt of the underlying themes of moral good and evil: I mean, Malfoy?) Plus, the Potter books they have Quidditch and the Pensieve, which the Spiritual Exercises do not (at least in my translation.) On the other hand, the Spiritual Exercises only takes four weeks, and those Potter books take, well, an eternity to read. Don't tell them that Dumbledore is gay. Let's not forget Dumbledore as wise, ancient spiritual director, allowing the exercitant (Harry) to undergo tests and experiences, and then revealing to him their meaning. The invisibility cloak, the mirror in which he sees his dead parents - what are these but tools of Ignatian contemplation? And Hogwarts looks not unlike certain Jesuit retreat houses I've been in: remote, forbidding, castellated - with big dining rooms and dubious plumbing. I think you're onto something here, Fr Jim. What Paulson misses, of course, is that there were Christian takes on HP almost since the beginning. John Granger's books, for example. His piece deals with academics, but it suffers by ignoring the wealth of "the Gospel according to Harry Potter" books out there. I'd like to chime in to second the pro-John Granger sentiment. Furthermore, there are some specifically Christian elements in these books. Lastly, backhanded thanks must go to the "His Dark Materials" series by Phillip Pullman. Those who might have objected to the HP ouvre at first, when seeing THIS come down the pike took a second, and far more sympathetic view of the books. "Straining at the gnat, but swallowing the camel." resonated rather clearly then. This post is very provocative. I saw Pullman on Charlie Rose a few years ago. Charlie asked him about his intentions in light of the criticisms of some of the blow hards on the right. Pullman answered that there was no dark intention behind his books. People who look for demons always find them, even if they aren't there.